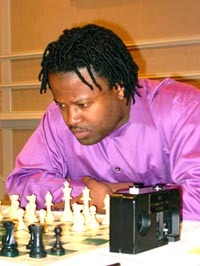 New in Chess features GM Maurice Ashley, an "Everyday Hero"
"Ashley is a hero because he's given back to the community that has given him so much. As Director of Chess Programs for the Harlem Educational Activities Fund, a non-profit children's organization, Ashley assists in developing self-esteem in local kids by teaching them strategy and skills of the game of chess." The article also mentioned his recent performance at Foxwoods and his qualification for the U.S. Championship. Photo of GM Ashley courtesy of Jerome Bibuld. All rights reserved.